Gubernatorial candidate and 2013 Pulitzer Prize finalist Juliette Kayyem will be the featured speaker at the annual luncheon of the Massachusetts Newspaper Publishers Association on Thursday. Until launching her campaign for governor, Kayyem was a columnist for the Boston Globe, analyst for CNN, and lecturer at Harvard’s Kennedy School of Government. In 2013, she was a Pulitzer finalist for her series urging the Pentagon to end its female combat exclusion rule – a prohibition the military has since lifted. Kayyem began her professional career in the Clinton administration as a civil rights attorney, litigating cases involving the rights of children. She helped bring the first federal anti-bullying case and was part of the team that argued for The Citadel and VMI military institutions to open their doors to women. She then moved into public safety and homeland security, serving as Gov. Deval Patrick’s homeland security adviser. After several years overseeing the 8,000-plus member Massachusetts National Guard, the Commonwealth’s strategic security planning, and the distribution of homeland security funds, she was tapped by President-elect Obama to be part of his transition team and then became assistant secretary for Intergovernmental Affairs at the Department of Homeland Security. As assistant secretary, Kayyem was responsible for coordinating planning between the federal government and all of its state, local, and territorial partners on issues as varied as immigration, intelligence sharing, military affairs, immigration reform, and the response to crises such as H1N1, the Dec. 25 attempted terrorist attack, the Haiti earthquake and the BP oil spill. For her exemplary leadership in the wake of the BP spill, coordinating 60 federal agencies over five states, Kayyem was awarded the Coast Guard’s highest civilian honor. Please join us for the annual meeting of the Massachusetts Newspaper Publishers Association on Thursday, Dec. 5, 2013, at the Hyatt Boston Harbor in Boston. Our annual meeting and luncheon is you’re preeminent opportunity to meet with newspaper publishers, editors, reporters and business staff from throughout Massachusetts. 10 a.m. Annual business meeting and election of officers and executive board. 11 a.m. Panel discussion: The Massachusetts Independent Contractor Law and its Impact on Newspapers. 12:30 p.m. Luncheon and keynote (speaker to be announced). Sen. Michael J. Rodrigues (D-Westport), sponsor of a bill to correct the wording of the law. Mark W. Batten, a partner in the Boston office of Proskauer who represents newspapers and other businesses in labor and employment matters. Aaron Julien, MNPA president and president of Newspapers of New England, who will talk about measures his company has taken as a result of the law. The registration form may be downloaded by clicking here . If you have any questions about the event, please address them to MNPA Executive Director Robert Ambrogi, (978) 546-3400, or info@masspublishers.org. Registration deadline is Friday, November 29. Registrations should be sent to: MNPA Annual Meeting, c/o New England Newspaper & Press Association, 370 Common Street, Suite 319, Dedham, MA 02026, or by fax to: (781) 320-8055. The Massachusetts Supreme Judicial Court’s Judiciary-Media Committee is conducting a survey of judges, clerks, registers, court officers, associate court officers, and media representatives to determine how SJC Rule 1:19 is working since it became effective on Sept. 17, 2012. Your answers will be valuable in helping the committee to evaluate whether to recommend changes in the rule to the SJC. The MNPA is a member fo the Judiciary-Media Committee. Responses to survey are due by June 11, 2013. Aaron Julien, president and CEO of Newspapers of New England, based in Concord, N.H., and publisher of seven daily and weekly newspapers, including the Daily Hampshire Gazette, The Recorder, the Valley Advocate and the Amherst Bulletin, has been elected president of the Massachusetts Newspaper Publishers Association. A resident of Amherst, Mass., Julien is a graduate of Middlebury College and Cornell Law School. First vice president: William B. Ketter, vice president of news of Community Newspaper Holdings Inc., based in Montgomery, Ala., and owner of 15 New England newspapers, including the Eagle-Tribune of North Andover, Mass. Second vice president: George Arwady, publisher and chief executive officer of The Republican of Springfield, Mass. Treasurer: Sheila Smith, publisher of The Daily News of Newburyport, Mass. Secretary: Bruce Gaultney, publisher of the Telegram & Gazette of Worcester, Mass. Elected to the association’s executive committee for three-year terms beginning Jan. 1 were Jim Foudy, publisher of the Daily Hampshire Gazette of Northampton, Mass. ; William T. Kennedy, chief operating officer of the Dow Jones Local Media Group; and Peter Meyer, president of the Cape Cod Media Group and SouthCoast Media Group. The annual meeting was held Nov. 29 at Anthony’s Pier Four in Boston. Please join us for the annual meeting of the Massachusetts Newspaper Publishers Association on Thursday, Nov. 29, 2012, at Anthony’s Pier Four in Boston. A registration form is available by clicking here. Massachusetts Attorney General Martha Coakley will be the featured speaker at this year’s luncheon. 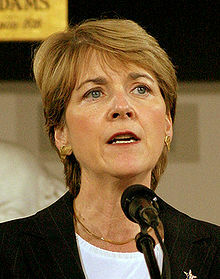 Re-elected to her second term as attorney general in 2010, Coakley previously served for eight years as district attorney in Middlesex County. Earlier, she was chief of the Child Abuse Unit in Middlesex. She began her legal career in 1979, practicing litigation at the firms Parker, Coulter, Daley & White and later at Goodwin Proctor. She joined the Middlesex DA’s office in 1986 and also served on the U.S. Justice Department’s Organized Crime Strike Force. The luncheon, which begins at noon, is also your annual opportunity to meet with newspaper publishers, editors, reporters and business staff from throughout Massachusetts. 10 a.m. Annual business meeting and election of 2013 officers and executive board. 11 a.m. Panel discussion: Is the Public Records Law in Need of Reform? Noon Networking reception (open bar). 12:30 p.m. Luncheon and keynote featuring Martha Coakley. The registration form is may be downloaded by clicking here. If mailing your registration without the form, please indicate the name of each registrant and the registrant’s choice of luncheon entrée: Chicken Chausseur or Broiled Scrod. If you have any questions about the event, please address them to MNPA Executive Director Robert Ambrogi, (978) 546-3400, or info@masspublishers.org. Registration deadline is Friday, Nov. 23. We look forward to seeing you on Nov. 29. Massachusetts Gov. Deval L. Patrick has issued a proclamation declaring today, June 28, to be Community Newspaper Day. See a PDF of the proclamation here: Community Newspaper Day. The proclamation was issued, in part, to recognize the 175 birthday today of the Patriot Ledger in Quincy, one of the oldest continuously publishing newspapers in the United States. The Massachusetts Supreme Judicial Court has announced approval of a new SJC Rule 1:19 governing Electronic Access to the Courts. The new rule replaces the former rule, which governed cameras in the courts, and extends it to recognize changes in technology and journalism since the original rule was promulgated. Notably, the rule is designed to recognize so-called citizen journalists. A PDF of the new rule is here: SJC Rule 1:19. The news media are defined as those who are regularly engaged in the reporting and publishing of news or information about matters of public interest. This would include citizen journalists who meet this standard. The news media are allowed to use laptop computers and other electronic communication devices inside courtrooms if they are not disruptive to the proceedings. Those seeking to cover the courts using the permitted technology are required to register with the SJC’s Public Information Officer, confirm that they meet the definition of news media and agree to follow the provisions in Rule 1:19. A judge has the discretion to permit electronic access by a person who had not registered. In addition to one video and one still camera, a second mechanically silent video camera is allowed for use by media other than broadcast television and still photographers. Motions to suppress may be electronically recorded. If news media ask to record multiple cases in a session on the same day, a judge may reasonably restrict the number of cases that are recorded to prevent undue administrative burdens on the court. The rule applies to clerk magistrates conducting public proceedings. The rule represents a significant step forward for electronic access to Massachusetts courts. Hearing March 6 on Bill to Create Journalist Shield for Mass. The Joint Committee on the Judiciary will hold a hearing this week on a bill to create a journalist shield law in Massachusetts. House Bill 2255, the Free Flow of Information Act, sponsored by Rep. Alice Hanlon Peisch (D-Wellesley), would bar state government from compelling members of the news media to disclose the source of any news or information. The hearing is set for Tuesday, March 6, at 1 p.m. in State House Room A-2. The bill would also bar the compelled disclosure of notes, outtakes, film and other materials collected by a reporter but not used in any news report, unless a court first determines that the information cannot be obtained anywhere else and there is an overriding public interest in the disclosure. In addition to barring disclosure of sources and notes, the bill would prohibit the state from compelling a reporter to testify except in cases where disclosure of the identity of a source is necessary to prevent imminent acts of terrorism. Massachusetts is one of only 10 states that does not have a statute that shields journalists from subpoenas. Last April, West Virginia became the 40th state to enact such a law. The District of Columbia also has a shield law. The Massachusetts Newspaper Publishers Association and the Massachusetts Broadcasters Association will be among those testifying at Tuesday’s hearing. Others with an interest in this bill are encouraged to testify or attend and show their support. Questions or suggestions may be addressed to MNPA Executive Director Robert Ambrogi, 978-546-3400, ambrogi@legaline.com.